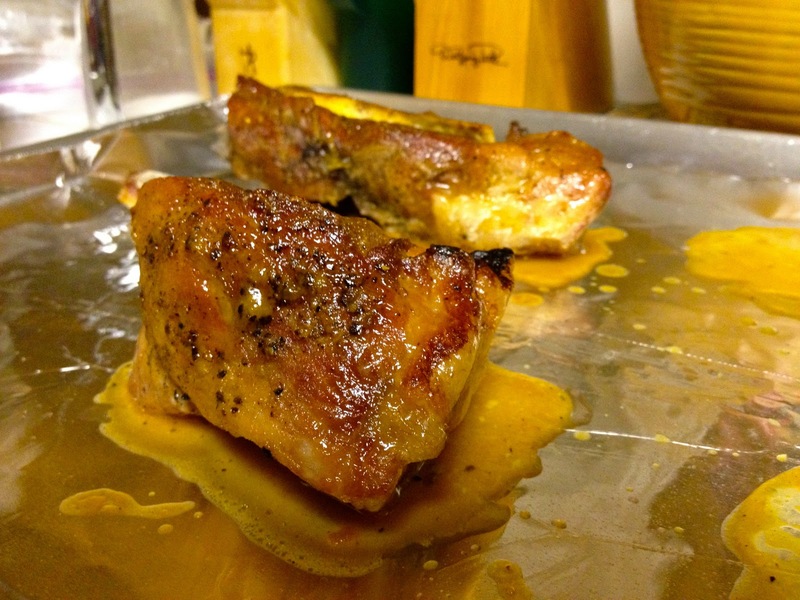 We had some pork ribs in the freezer, and I've been trying to use up what's in there lately, so I cooked this up. The ribs were slow cooked in the oven, and then glazed and put under the broiler to crisp up. 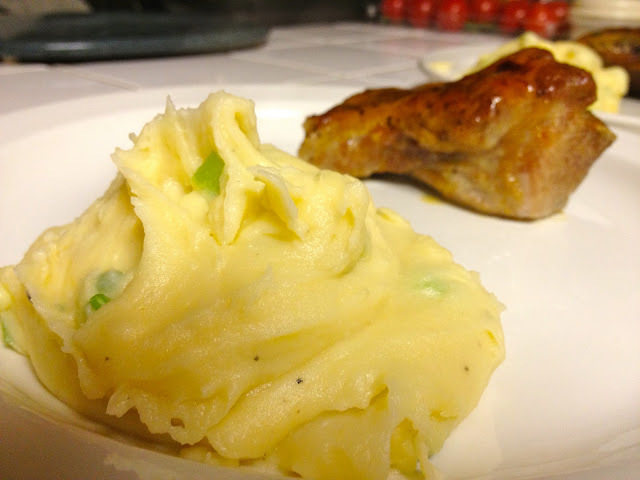 I love potatoes as a side dish, so I just used some instant potatoes we always have around, and added some cheddar cheese and green onions, just because I felt like it! 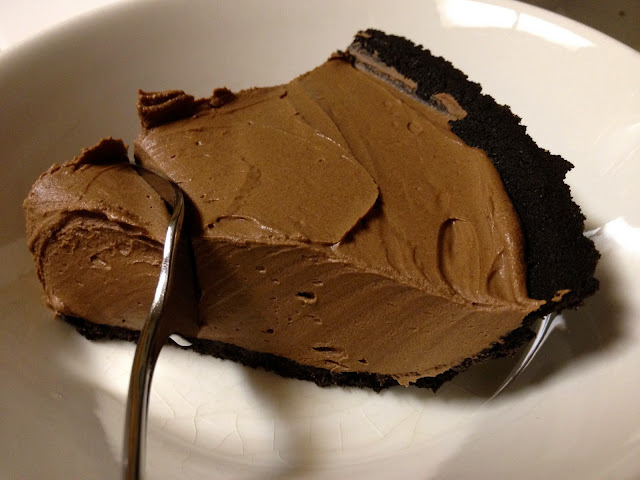 The chocolate pie was a strange recipe, no dairy, just chocolate and tofu! I know, I was skeptical, but it turned out delicious and you couldn't tell there wasn't any dairy in it. 1. Combine the vinegar and brown sugar in a small saucepan over high heat and cook, stirring occasionally, until the sugar is completely dissolved and mixture reduces slightly, about 5 minutes. Remove from the heat and whisk in the honey and mustard and season with salt and pepper, to taste. Let cool to room temperature. 2. Preheat the oven to 500 degrees F.
3. Brush the pork racks on both sides with canola oil and season with salt and pepper, to taste. 4. In a saucepan over medium-high heat, combine the soy sauce, 4 cups of water and the ginger and bring to a boil. Pour the mixture into the bottom of a roasting pan, fitted with a rack, and arrange the ribs on the rack. Wrap the pan with foil and roast until the ribs are tender, about 1 ½ hours. 5. Remove the ribs from the oven and transfer to baking sheets lined with foil or parchment paper. Turn on the broiler and let heat for 3 to 5 minutes. Brush the ribs heavily on the top side with some of the glaze, put under the broiler and broil until golden brown and a crust has formed. Remove from the oven to a cutting board and brush with more of the glaze. Let rest 10 minutes before slicing. Arrange the ribs on a serving platter and serve with more glaze. *Note: You may have noticed many canned/boxed grocery items have slightly reduced the volume of the food, and kept the same price. Not only is this BS, but it also makes recipes difficult to reduce to compensate. This was the case with the tofu, so I had to slightly reduce everything else. I just guessed, do the same if you notice this as well. 1. Place enough water in the bottom of a 4-quart saucepan to come 1 inch up the sides. Bring to a simmer over medium heat. 2. Melt the chocolate chips with the liqueur and vanilla in a medium metal bowl set over the simmering water, stirring often with a rubber or silicone spatula. Combine the tofu, chocolate mixture and honey in a blender or food processor and spin until smooth, about 1 minute. 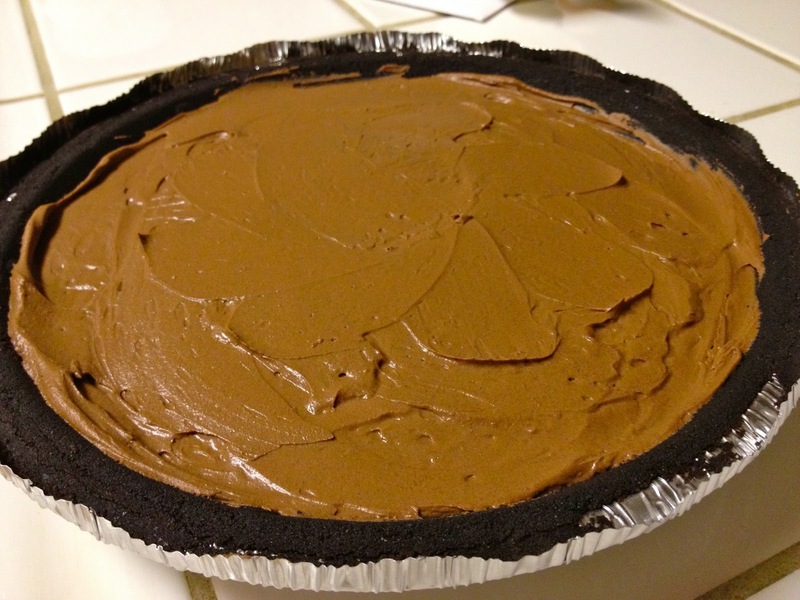 Pour the filling into the crust and refrigerate for 2 hours, or until the filling sets firm.